What is Cementum Annuli aging? The basis for cementum aging is the cyclic nature of cementum deposits on the roots of mammals’ teeth each year, which results in a pattern of “rings” in the tooth, like those formed in the wood of trees. A darkly staining ring, or “annulus”, is formed during winter on most all mammals. Abundant, lightly staining cementum is formed during the growth seasons of spring and summer. Some “experts” say these rings occur because of nutritional or seasonal stress, but since the same rings occur on human teeth, we doubt that is true. The purpose of these cementum layers on the roots of mammals’ teeth is to provide a new “rough” surface for the flesh in the jaw to adhere to the root of the teeth each year. To obtain the age the teeth are put through several chemical processes and then sectioned thinner than paper using advanced histological techniques. We then view the teeth under a microscope to count the cementum annuli rings. See the image below as a demonstration. How does cementum-annuli compare to that of eruption-wear? The molar wear technique of aging ungulates compares the tooth wear of known age animals to the tooth wear of harvested animals. The theory is that you should be able to determine age by finding a match, wear wise, with a known age specimen. I think the cold hard facts show that this is just guesswork, especially for deer 2 ½ years or older. Simply spoken, molar wear does not work if you want an accurate age of the animal you harvested. It is a myth that is still taught to wildlife biologists in college today, even though only one study done in 1949 purported to have scientific evidence it actually worked. Ever study done since then has been unable to verify its accuracy. The cementum-annuli (cross-sectioning teeth) method of aging deer, elk and other wild animals is much different. It first requires decalcifying the central lower incisors (sometimes the M1 molar or other tooth) and then cutting cross-sections of the root tips to a thinness measured in microns. The slice of tooth is then placed on a slide and a special dye is added to enhance viewing. It is placed under a microscope. Lines within the tooth’s diameter are readily visible and can be counted much like the rings of growth on a tree, indicating a deer’s age. In a study done by Kenneth L. Hamlin et al. of the Montana Fish, Wildlife, and Parks ( Journal of Wildlife Management 64(2):441-449) accuracy rates of cementum annuli were 97.3% for elk through age 14, 92.6% for mule deer through age 14, and 85.1% for white-tailed deer through 9 years old. Tooth eruption or tooth replacement is a highly reliable way to age mammals until they have all their permanent teeth. In whitetails you can accurately place deer as 6 months old, 18 months old, or 2 ½ or older using this easily learned technique. Curiously this molar wear aging is still part of the course curriculum taught to current wildlife biology students. That is probably a key reason that the myth continues. Are you still accepting the pre-paid kits previously purchased? We are currently accepting them and they just need to be sent to the new address which is 2814 Brooks St. #114 Missoula, MT 59801. If you sent teeth to the former Texas address the mail forwarding ended in June and the teeth will be returned to you by the United States Postal service. Just re-send them to the new address and we apologize for the inconvenience this may cause you. Can you tell me the age if I have only one of the incisors? Yes. We ask for the second incisor as backup, in case something happens to the first incisor during processing. Also, If there is a significant difference between what we see under the microscope and the other data you have provided (including estimated age), we process the second incisor, this time taking 4 slices for analysis. We then give you the results based on what we see on these slides. So, if you only have one incisor, send it to us and we should be able to the age for you. How do I package the teeth? Place your order online and we will send you an envelope with instructions on how to package the teeth. In the mean time if you have already extracted them place them in a PAPER envelope and no plastic with a bit of salt to remove the moisture. Where do I send the teeth? Is there a discount for multiple sets of teeth? My tooth broke off when extracting what should I do? This is a common problem if a jaw is very dried out. Either way not to worry. Simply saw off the front row of teeth (front mandible) and include cash, check or money order in the amount of $5 with your tooth submission and we will ensure the roots are safely extracted. Why do you ask me to provide the estimated age of the trophy? I thought I was sending those teeth to you for you to tell me that! 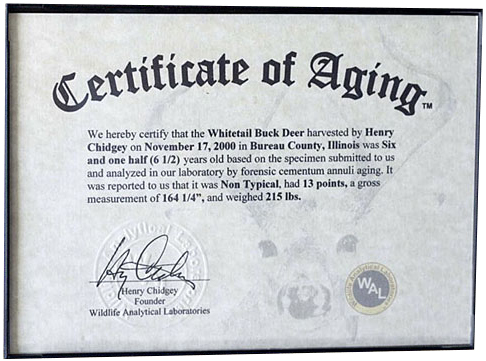 We are committed to giving you the most accurate information regarding the age of your trophy that we can. We long ago decided that the best way to do that was to use all the data we receive about each specimen to help us in that determination. We intend to be and believe we are the “CSI” of the game mammal aging world. One piece of that information is your estimate-which comes from your observation of the live mammal, trail cameras, etc. If there is a significant difference between what we see under the microscope and the other data you have provided (including estimated age), we process the second incisor, this time taking 4 slices for analysis. We then give you the results based on what we see on these slides. Why do people care how old their harvested deer (or other mammal) is? What we mean by Respect/Honor is that for many hunters/wildlife stewards knowing everything possible about the life and condition of the harvested animal is just one more way to have the taking of the animal’s life be respectful and appreciative. The accurate age is one element of this knowledge. Harvest Criteria refers to learning how to accurately age the animal prior to harvest and then verifying that decision after the fact. One way we know to communicate this is by way of an analogy. If you were a master gardener and your passion was growing tomatoes you might have as an objective raising the largest, most beautiful tomatoes you could. In addition to genetics and nutrition (soil, fertilizer and water) you would want to learn the right time to pick or harvest these tomatoes. You wouldn’t want to pick them too early or too late. Experience of picking too early & too late, over time, would allow you to do a better job at maximizing your goal—having the largest, most beautiful tomatoes you could. Whitetail deer hunters and managers have goals for bucks that are very similar to these master gardeners. They want to have the bucks they harvest achieve their maximum potential. In a whitetail that usually occurs when they are 5-6 years old. They want feedback on the deer that they harvest about how good their judgment was this time, so that they can learn and improve their skills at judging age before they squeeze the trigger or let loose of the arrow. Scientific Management Data refers to the need to know the age of harvested mammals so as to collect data that enables correlation between habitat and the health of the mammals in that habitat. Body weight vs. age is a critical indicator over time of changes in habitat conditions either good or bad.